I don’t go to shopping malls much these days–in fact, they kinda terrify me. But if a geothermally heated, solar powered, sky-garden capped extravaganza like this ever made its way into my neighborhood, okay, I’d probably check it out. Architectural design firm Vincent Callebaut has brought us many an incredible eco-urban concept in the past, from villas that produce more energy than they consume to twisting garden skyscrapers that resemble DNA. 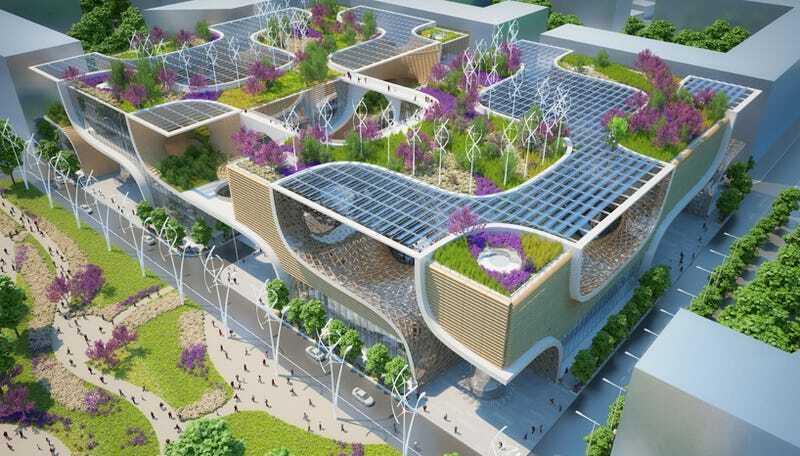 Their latest project, “Wooden Orchids” is described on the firm’s website as an “eco-responsible shopping mall.” It runs, of course, entirely on renewable energy sources, captures and recycles rainwater, and encourages organic eating with its rooftop gardens and farmers markets. The interior is replete with gardens, ponds and sunshine. The concept is intended for provincial China, but if Berkeley residents were given a carte blanche to refashion a midwestern suburb, they’d probably come up with something similar.